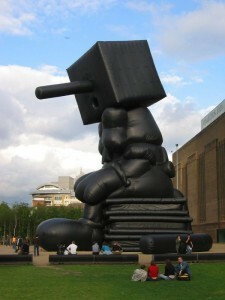 “Blockhead by Paul McCarthy @ Tate Modern” image from flickr user Matt Hobbs. Used by permission. Alan Turing proposed what is the best known criterion for attributing intelligence, the capacity for thinking, to a computer. We call it the Turing Test, and it involves comparing the computer’s verbal behavior to that of people. If the two are indistinguishable, the computer passes the test. This might be cause for attributing intelligence to the computer. Or not. The best argument against a behavioral test of intelligence (like the Turing Test) is that maybe the exhibited behaviors were just memorized. This is Ned Block’s “blockhead” argument in a nutshell. If the computer just had all its answers literally encoded in memory, then parroting those memorized answers is no sign of intelligence. And how are we to know from a behavioral test like the Turing Test that the computer isn’t just such a “memorizing machine”? The article is published in the open access journal Philosophers’ Imprint, and is available here along with code to computer-verify the calculations.